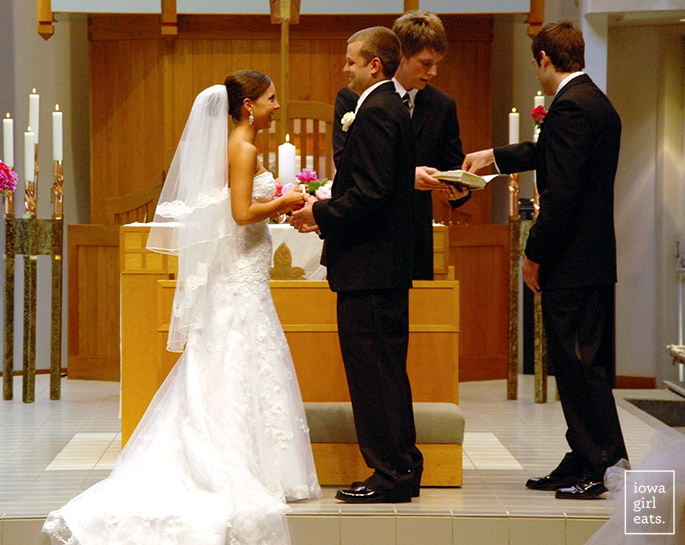 Today is Ben’s and my 11 year wedding anniversary – holy moly, does time fly! Most people are surprised to learn that Ben and I have known each other since Kindergarten – we were in opposite corners of our class picture, ha! – though we didn’t start dating until the summer before our senior year in college. We ran around with the same group in high school but the stars didn’t align for our singles selves until that fateful summer when we reconnected at home before dating long distance at separate schools for a year. Three years later he got down on one knee and we’ve never looked back. Ben and I are total opposites in so many ways. He is the hip hop to my 90s pop. The night owl to my early bird. The calm to my crazy. The messy to my tidy. The patient to my impulsive. The big picture to my small details. The cautious to my spontaneous. The extro to my intro. But, it works. I don’t know what I did in a previous life to deserve this caring, kind, supportive, wise, thoughtful, fun, insightful, hard-working, loving, and giving man, but it must have been something pretty epic. Is marriage hard? HELL yes!!! But this guy makes it as easy as it can possibly be. Ben’s the kind of person that saves you the last bite, never watches ahead in Netflix, and only throws a minor fit when you “fix” the garage door handle by accidentely gluing it on backwards with gorilla glue. What can I say, he agreed to for better and for worse! Truly Ben makes me strive to be a better person every day. He is the first to help and give of whatever his family or friends need. Anyone who knows Ben would agree that he is the best of the best. I totally married up…which is what I remind myself of every time I have to pick up his socks from the bedroom floor. I mean, the hamper is RIGHT there! Not only is Ben the best husband on the planet (minus those socks,) but he’s also the best Dad. The best, best, BEST Dad. Fun, soft, patient and full of wisdom – these kids are incredibly lucky. Ugh! Cheers, my love, to 11 years down and many, MANY more years to go! 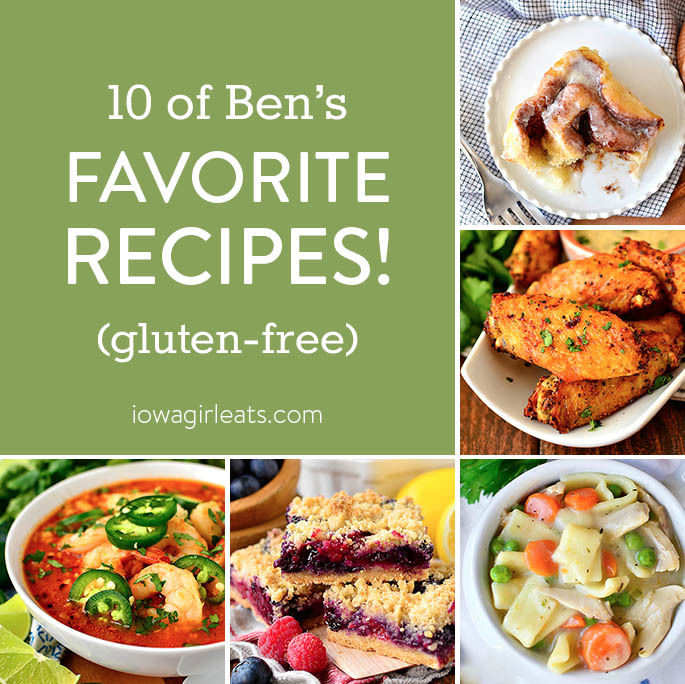 In honor of my dear husband, and our 11 years of marriage, I thought it’d be fun to share 10 of Ben’s favorite recipes today. Probably should have made it 11 recipes but that seemingly obvious thought didn’t occur to me until just now, and we’ve already come too far. Ben is an awesome cook – many of the recipes we both love and that I’m sharing below came from his brain – but since I work from home I do most of the day-to-day cooking. 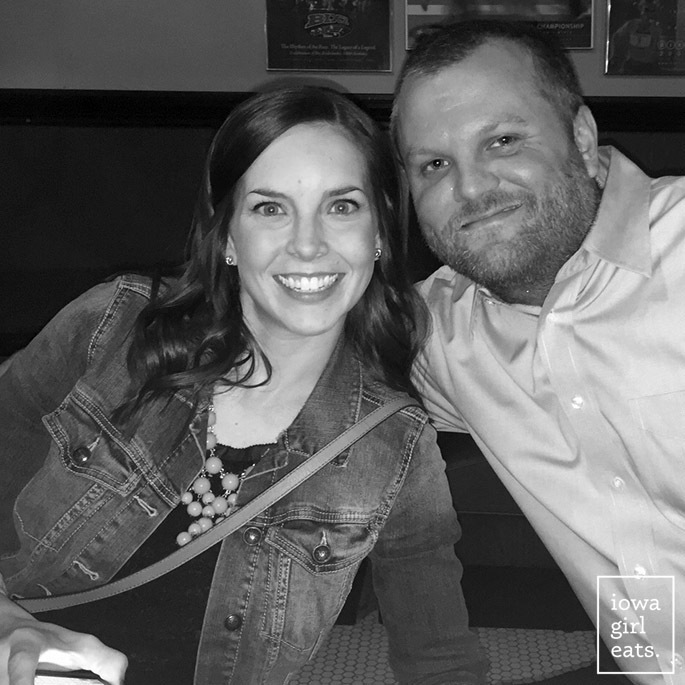 He takes care of us on the weekends when he has time to slow down and cook a stew, or throw a few racks of ribs or a brisket on the smoker (his favorite hobby,) but when it comes to dinner Monday – Friday, Mama’s in charge and these are the recipes he’s always glad to see on the menu. Spicy, crispy, comforting, and packed with flavor, maybe a few of these will become favorites of yours too! In general, Ben isn’t a huge fan of soup but he makes exceptions for the two soup recipes in this list, including Spicy Shrimp Soup. 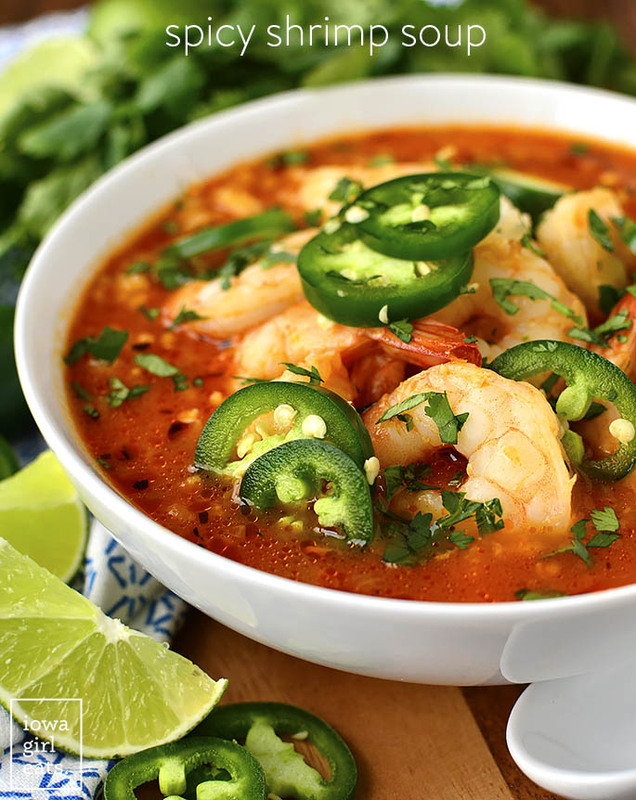 Or should I say especially for Spicy Shrimp Soup – maybe because he created the recipe! 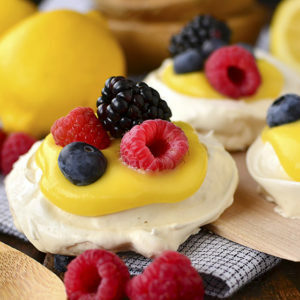 ;) This is one of the most popular recipes on IGE. Ben truly knocked it out of the park. Warming and spicy, filling and so flavorful, it’s such a treat. Super easy too. Ben always requests that I make Smoked Sausage and Chicken Gumbo when his family comes into town. 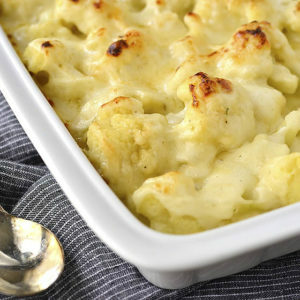 It’s a crowd-pleaser and just total comfort food. 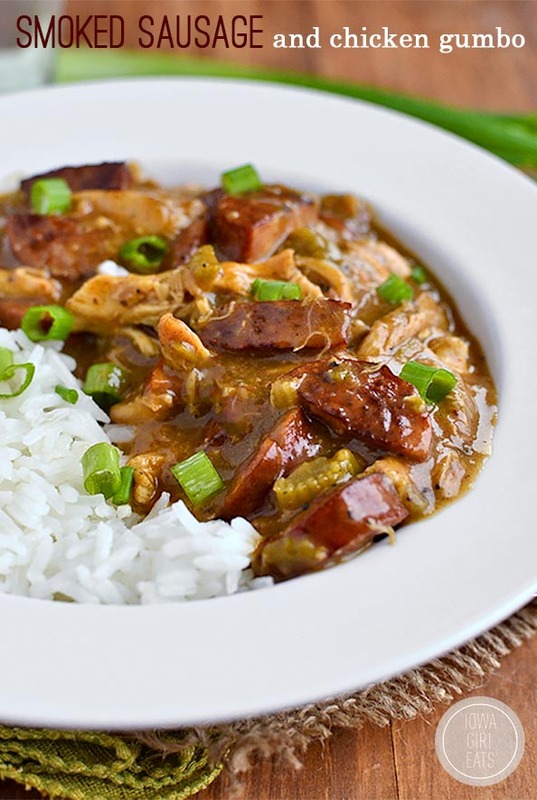 Having adored our travels to the south – Charleston, New Orleans (<< omg we were babies), and Savannah in particular – we love a good gumbo recipe! Another Ben original! 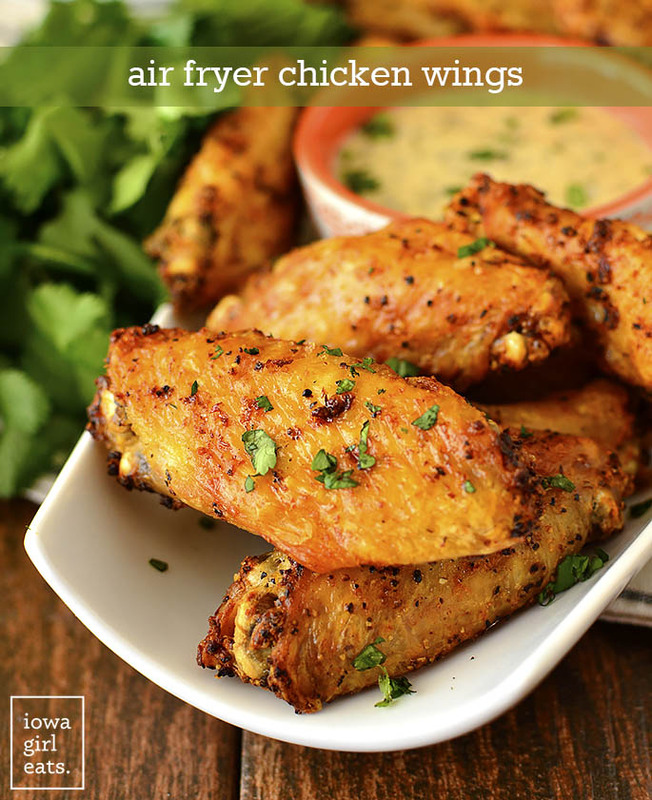 I don’t think I would have ever thought to put chicken wings in the Air Fryer had Ben not randomly given it a go a couple months ago, but Air Fryer Chicken Wings are now one of our favorite guilty pleasures. Crispy on the outside and juicy on the inside – we can demolish several pounds of these babies if we put our minds to it! Ben is a comfort food fan and thus LOVES my Gluten-Free Homestyle Chicken and Noodles. You would never know these homemade egg noodles are gluten free. They’re thick, soft, and chewy, and thicken up this hearty, comforting dish. This is another recipe he requests I make for his family when they’re visiting. If you read the post for my Gluten-Free Cinnamon Rolls, then you know Ben was my chief taste-tester while developing the recipe. This man ate more (bad) cinnamon rolls then I can count before I landed on the perfect recipe, which he still happily eats to this day. What can I say, no man, including Ben, can resist warm butter, sugar, and cinnamon. The first time I made Kimchi Fried Rice I used leftover chopped smoked ribs from one of Ben’s meat smoking sessions and it was off the CHAIN!!! Just a thought if you’ve got leftover smoked pork laying around, as one does. 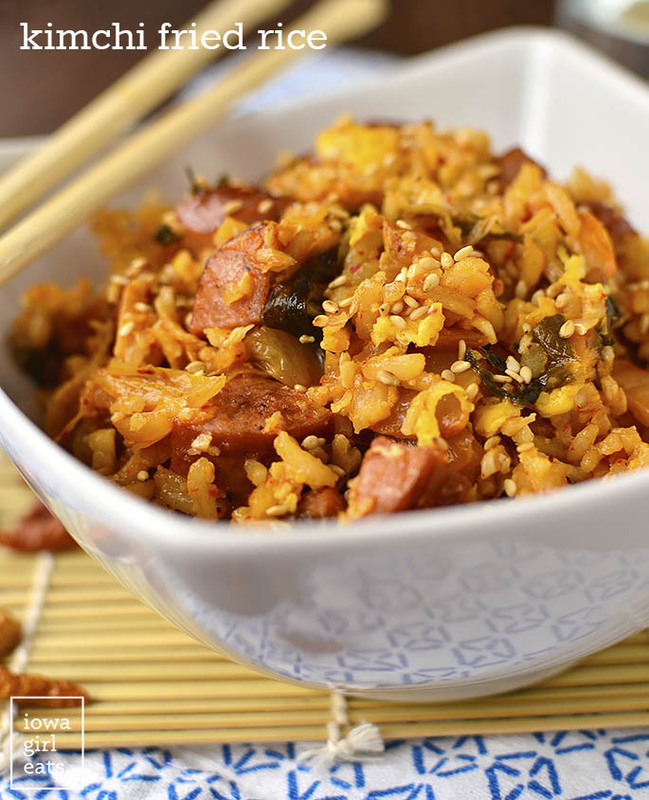 Using meat he’s smoked, or the store-bought smoked sausage I call for in the recipe, Ben is always happy when Kimchi Fried Rice is on the dinner menu. I’ve been making Ben BBQ Chicken Quesadillas for 11 years now – ie our entire marriage. He never gets sick of them, which says a lot because the dude likes himself a little variety. 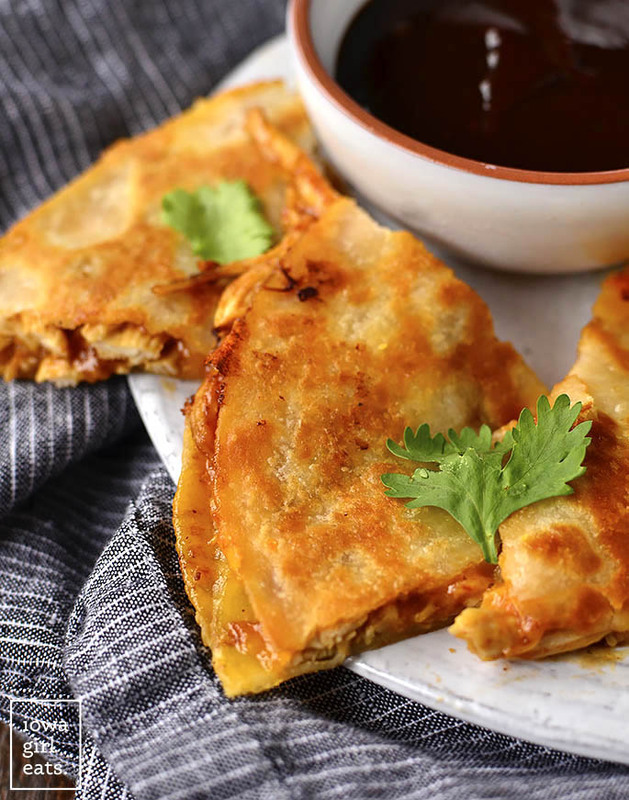 They’re incredibly easy to make and the combination of chicken, BBQ sauce, cheese, and crispy tortilla is a match made in heaven. Ben has almost no taste for chocolate – except frozen Thin Mints and/or Twix Bars – preferring cheesecake with raspberry sauce, blueberry pie, or Triple Berry Crumb Bars for dessert instead. 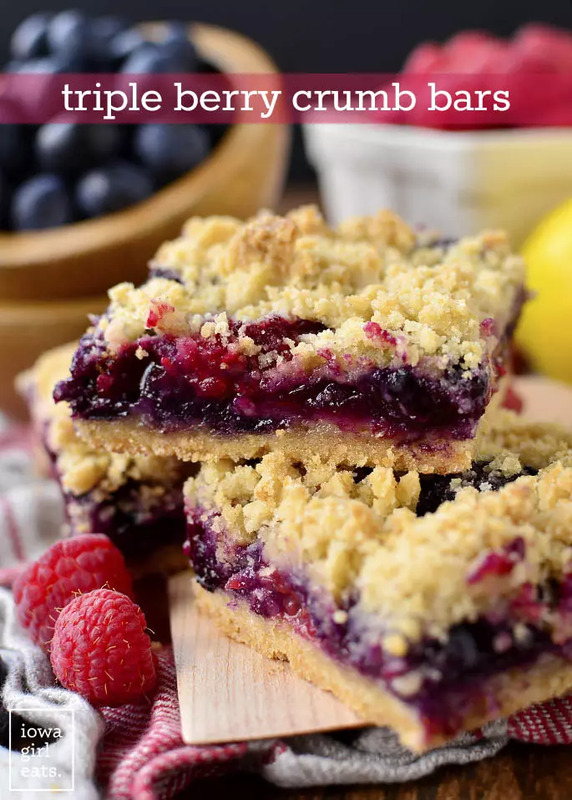 It is not uncommon to find him shoveling a bar or four into his mouth over the baking dish after making this easy dessert recipe! Not only does Ben love my Easy Chicken and Rice Soup, but the little boys do too. It’s a family favorite and I make it often, especially because we always have the ingredients on hand. Lately I’ve been reducing the amount of chicken broth to make it more of a risotto / porridge consistency and oh my gosh, we all fight over the leftovers. so good! Happy Anniversary! 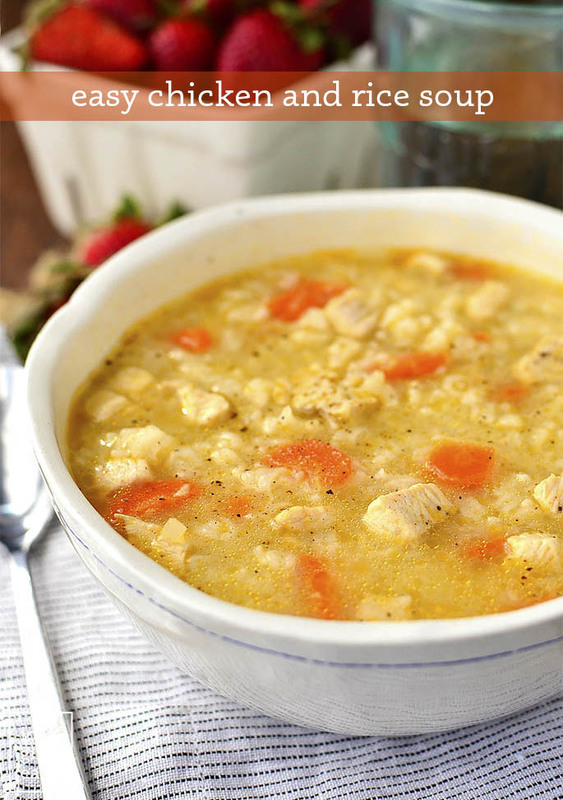 What amount chicken broth have you been using to make the Chicken and Rice soup less “soupy”? We aren’t huge soup eaters, but my kids love rice! Hi Lara! I don’t measure anything because I have the recipe committed to memory! 😂 What might be easiest is to use the same amount of broth but add additional rice – maybe 1-1/2x the normal amount. Keep some extra broth on hand to add if you need it! I also have your chicken rice soup recipe committed to memory and I make it almost weekly oh, October – March maybe?! It is so comforting, easy, healthy, and satisfying! Happy Anniversary! 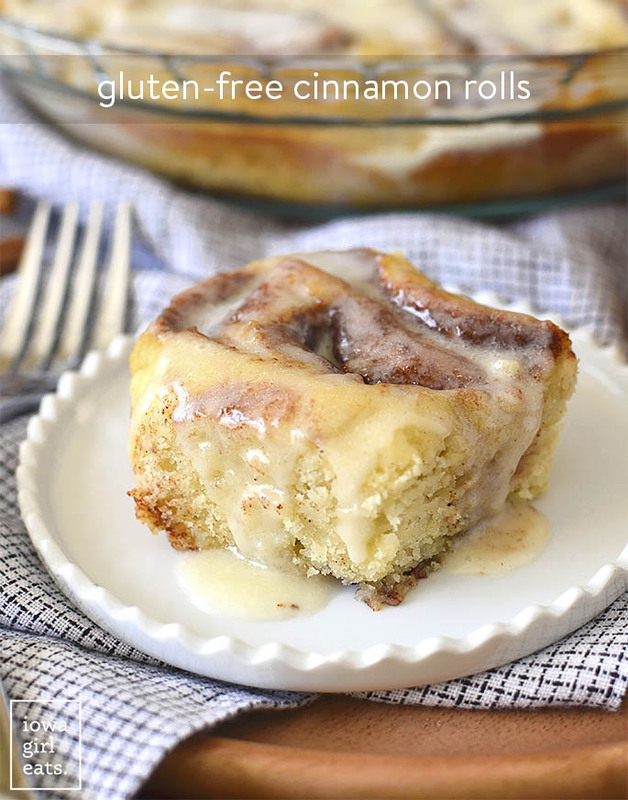 Your cinnamon roll recipe is the best!! Yess, so glad to hear it, Erika! Congratulations! 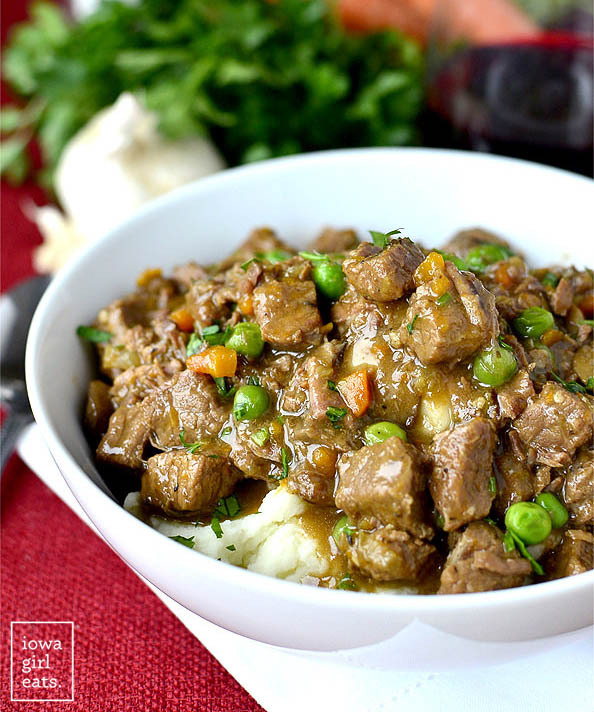 Ben’s Beef Stew has become a family favorite in our home! Yah! So glad to hear it, Stephanie! 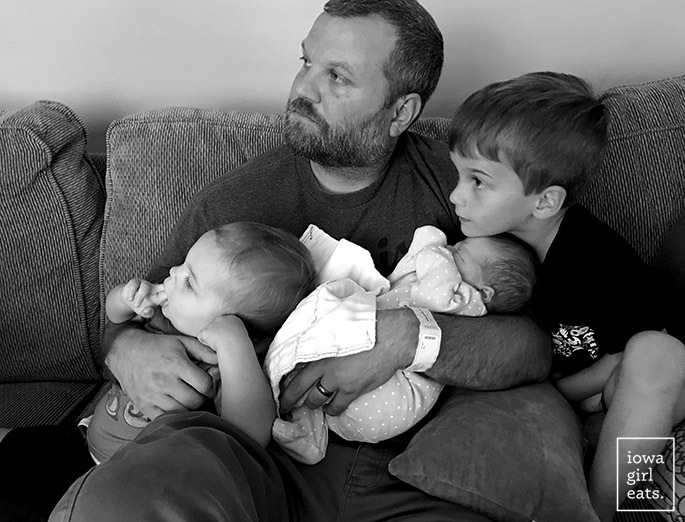 That photo of Ben and the three children is swoon worthy. OMG And what a pretty bride you were. Happy Anniversary! Happy Anniversary! I loved this post. I could have written the same things about my wonderful husband. He hates recognition of any kind, and so much so, that getting birthday or Christmas presents is an ordeal for him. It’s worse for us because we are never sure he actually likes anything – even if it’s something he has asked for! We will be married 48 years in December, and it has been a process. Sometimes it is hard, but it is so worth it. He has had dementia for the last ten years, and and although he has forgotten a lot of things, he has never for forgotten for one minute that he loves us. We grew up in Dubuque 6 blocks apart, but we didn’t meet until college. I knew he was a keeper from the start. Those Iowa boys are the best. I’m so sorry to hear about your husband, Mari, though it sounds like you two have had a happy and full life together so far. <3 Thanks for sharing your story! Happy Anniversary to two of my favorite people! What a fun wedding that was! Love you! Thanks for sharing Ben’s faves. I need to try some of these for my hubby. I can totally see him loving down that beef stew. Pat would approve, I feel. ;) Love you Nat. That is the absolute sweetest tribute to your husband, and so hilarious also…love the socks and hamper!!! Happy Anniversary!! Truly a joy to hear about your young family, your writing is so entertaining!! Also, your soup recipes are an absolute staple in my home. Thank you and have a wonderful anniversary weekend!!! They have definitely stood the test of time!! Happy anniversary to you both, and many more! Happy Anniversary!!! Nothing better than having a great husband AND father!! Happy Anniversary! 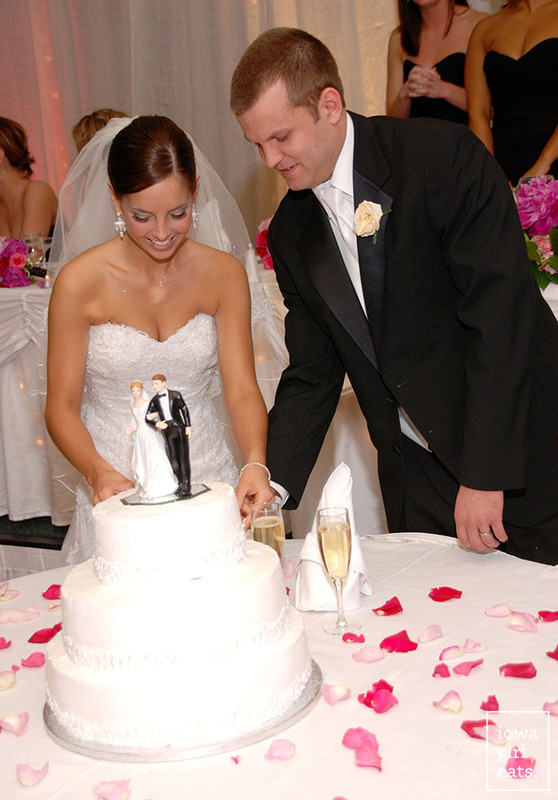 April 5th this year also marked 11 years for my hubby and I!! Yay! Hope you love the recipes, Sharon! Thank you for sharing these recipes. Hope these are so tasty and nutritious too. My pleasure, Olivia – I hope you enjoy! It looks like you two are a great team. OMG What a sweet tribute! This is great!!! I had to tell you that I made the chicken and rice dish last night for 2 sick kiddos and I’m in LOVE. It was SO delicious and SO easy. Thank you for your amazing recipes and congratulations on your anniversary! Happy Anniversary! I always tell people that my husband and I compliment each other :) We have been married for 11 years too and just the other day realized we’ve been dating for 15 years! Kristin, this is the absolute sweetest tribute and I feel like I know you and Ben so much better. It reminds of the tender children’s book, You Are My Miracle. I love this! And you just handed me 2 weeks worth of meal planning!!! 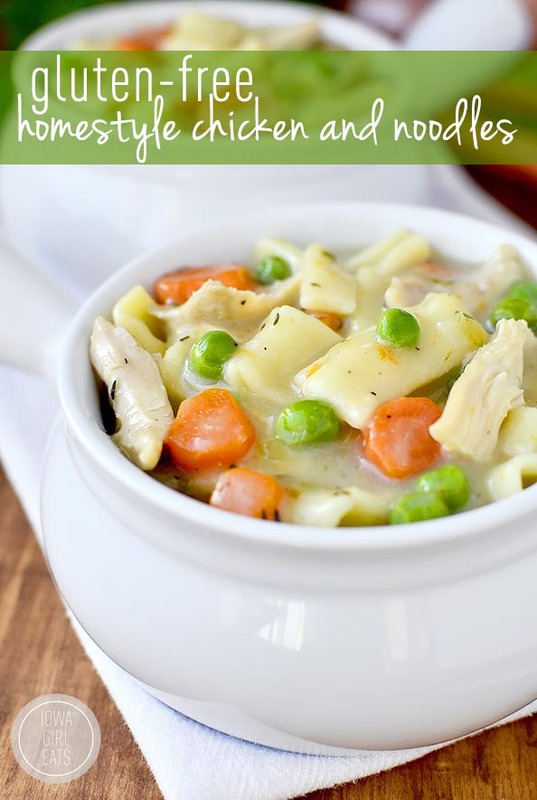 I’ve only made the chicken and noodles from this list so my family is in for a treat!